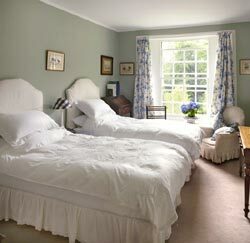 Bed and breakfast in Central Scotland in the hills near Stirling. Easily under 1 hour from Edinburgh and Glasgow airports. 5 miles from Stirling. Optional dinner. 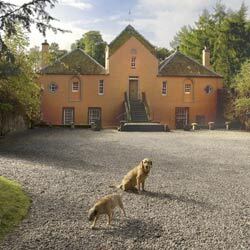 Bed and breakfast in a fascinating old house 5 miles from Stirling. Optional dinner. In central Scotland, 5 miles north of Stirling, hidden in the idyllic wooded valley of the Allan Water (left) is Old Kippenross, family home of Sue and Patrick Stirling-Aird, who welcome guests to stay for bed and breakfast (with optional dinner). Old Kippenross is a fascinating house, quite unique in Scotland. 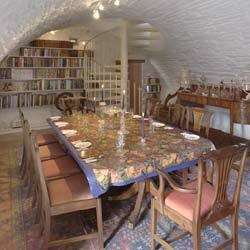 The upper part was built in the 1700's above the remains of an older Tower House whose vaulted basement is now the kitchen, dining room and drawing room. The stone steps which you can see in the photograph above lead to the front door. 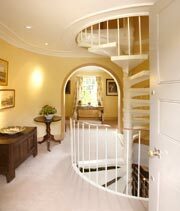 Inside the hall a spiral staircase (right) rises through the house from bottom to top. 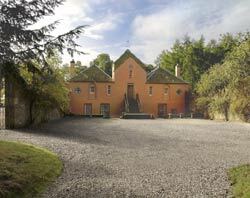 Tradition has it that Old Kippenross was painted pink in 1715 as a signal to Jacobites after the battle of Sheriffmuir that it was a safe haven. Linking the house with the riverbank below there are rumoured to be two underground tunnels for clandestine escape. Some say that nane wan at a' man." With just under 200 acres of parkland, riverbanks, garden and woodland to explore, this is a relaxing, romantic and memorable place to stay, and very central for touring Scotland. Double bedroom and bathroom en suite, at the top of the house (in the middle) with a window looking over the garden. 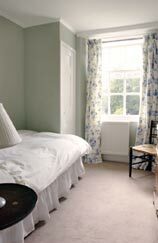 Twin bedroom on the first floor, with a window looking over the garden. Dressing room or single bedroom, en suite and Bathroom (en suite). Dressing room or single bedroom, en suite with the twin bedroom. The stone vaulted ceiling is part of the basement of the original 17th Century Tower House, and this may have been originally a kitchen. 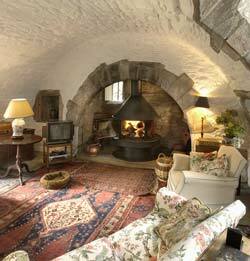 There is a traditional domed bread oven inside the arched fireplace. 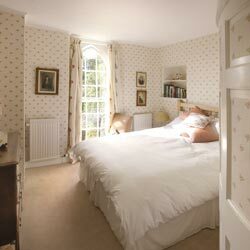 £54 to £66 per person per night based on two people sharing a room, and including breakfast. 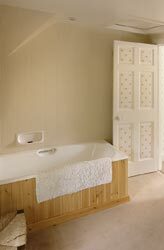 Both bedrooms have a bathroom en-suite with bath and power-shower. £30 per person for dinner. Guests are welcome to arrive after 5.00 pm. View from the bottom of the garden. ★ Jane Stirling was born at Kippenross and became a devoted pupil of Chopin in Paris in the 1840s (He dedicated two nocturnes to her in 1844). She encouraged him to visit Scotland and accompanied him on a tour during which he visited Kippenross. 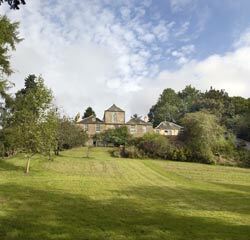 Next to the house, on the left, is the old walled garden where they used to walk together. Please tell Sue and Patrick you found Old Kippenross through About Scotland!